SALEM, Ore. -- Seventeen years after Oregon decided to become the first state to hold all elections with mail-in ballots, it took another pioneering step on Monday to broaden participation by automatically registering people to vote. Under the legislation, every adult citizen in Oregon who has interacted with the Driver and Motor Vehicle Services Division since 2013 but hasn't registered to vote will receive a ballot in the mail at least 20 days before the next statewide election. The measure is expected to add about 300,000 new voters to the rolls. "It just changes expectations for who's responsible for making elections work," said Barry Burden, a professor of political science at the University of Wisconsin in Madison and director of the Elections Research Center. "In every other state it's the responsibility for the voters to make sure it happens." Some other states have considered such legislation but none has gone as far as Oregon. Minnesota nearly implemented automatic voter registration in 2009 before the plan was vetoed by Gov. Tim Pawlenty, who said "registering to vote should be a voluntary, intentional act." 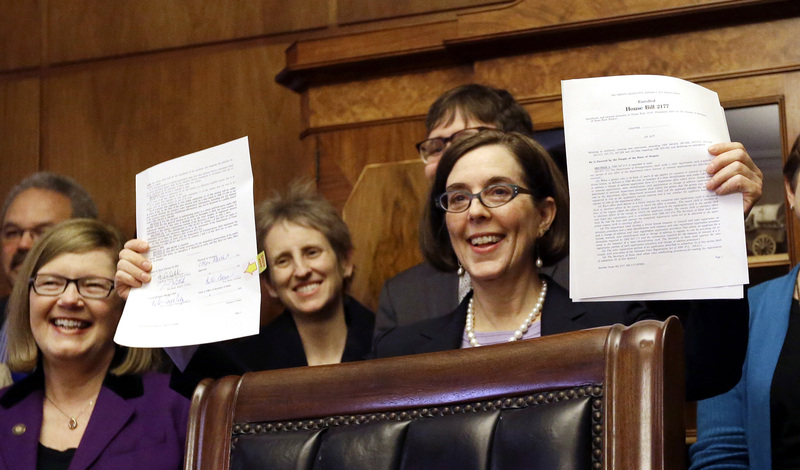 Similar concerns were raised by Oregon's minority Republicans. "Simply because it makes us unique or makes us first does not necessarily mean that it actually improves on what we're doing," said state Sen. Jackie Winters, a Republican from Salem. Information the DMV has on file, such as age, residential information, signature and citizenship status, will be transferred to the secretary of state, who will then automatically update registration information. When it came up for a vote in the state Senate last week, all Republicans and one Democrat voted against it. The Democrats hold a 18-12 advantage in the Senate so the bill easily passed. State Sen. Elizabeth Steiner Hayward, a Portland Democrat who carried the bill in the Senate, said there were rumblings the measure was a "secret plot" to enroll more Democrats. But she denied that was true. Oregon already has one of the highest voter registration rates in the nation - 73 percent of Oregonians were registered to vote and 70 percent of them cast ballots during the 2014 general election. Tony Green, spokesman for the secretary of state, said the legislation is expected to eventually capture all unregistered voters who are in the DMV database after taking actions such as obtaining or renewing a driver's license. Two years ago, when the measure was first proposed, Green said there were questions about whether the Driver and Motor Vehicle Services Division records were confidential under federal law. The legislative counsel determined the secretary of state and the division could share information as long as it was for legitimate government purposes, he said. People eligible to vote will get a postcard saying they've been registered and have three weeks to opt out. They'll be automatically registered as unaffiliated but can select a political party from the postcard and return it to election officials through the mail. Automatic registration is not uncommon in other countries. A 2009 report by the Brennan Center for Justice says nations where the government takes the lead in enrolling voters have much higher registration rates. Argentina has a 100 percent registration rate, while Sweden, Australia and Canada all have registration rates over 90 percent. Myrna Perez, deputy director of the Brennan Center's Democracy Program, said a state needs to already have reliable agency records of eligible Americans who have demonstrated citizenship in order to successfully follow in Oregon's footsteps. Oregon only grants driver's licenses to people who can prove they're in the U.S. legally by presenting passports, birth certificates or other documents. David House, a spokesman for the Driver and Motor Vehicle Services Division, has said the agency can separate citizens from noncitizens based on those documents. Oregonians were the first to see all-mail elections, and the state has since been followed by Washington state and Colorado. "Oregon is a true leader in accessibility to voting and I challenge every other state in this nation to examine their policies and find ways to ensure there are as few barriers as possible in the way of the citizen's right to vote," Brown said.